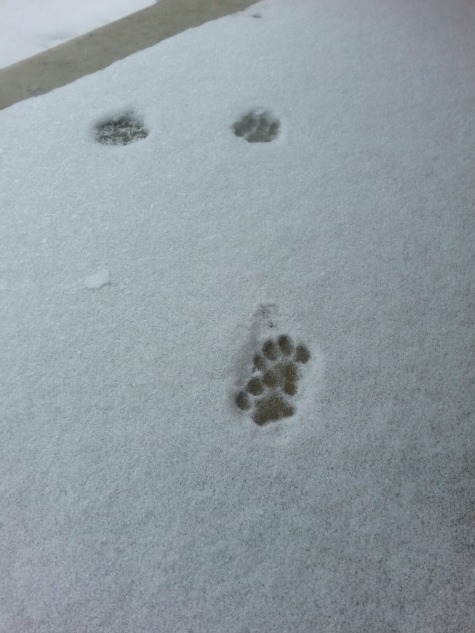 This entry was posted in Uncategorized and tagged hunger, kitty prints, paw prints, snow, traveling. Bookmark the permalink. I’ve not come across that quotation from Stevenson, but it certainly resonates. I’m suffering a bit from the urge to “go” myself. Spring is here, on the Gulf coast, and I know there are flowers blooming and birds getting ready to head north, and if I don’t get out there, I’ll miss it. That’s the only real downside of my work. After a long stretch of bad weather, when the good weather comes, work has to come first. The poem and photo are great. It makes me want to set out some food right now, for whoever is roaming around. What a life they have, those little outdoor critters. I’m sure they’ll be glad for spring, too. Oh boy! Are they cougar tracks? Nice imagination, Professor, and, while I think you’ve got the right “family,” I imagine these prints are those of a domestic house cat — most likely, one belonging to my neighbor. The day after I snapped this shot, a HUGE furry blond cat sauntered across our porch (inciting much protest from the snoozing Dallas), so I’d bet he was just retracing his steps. Awww! Poor little thing! Love the poem – so apt! What kind of creature was it, do you know? Not sure, FF, but I think it might have been my neighbor’s house cat. He(?) is as regular as clockwork, traipsing across our property on his way to who-knows-where! Poor Dallas has fits when he catches sight of him, but the cat merely returns a bored, ho-hum sort of stare and continues his jaunt. Debbie, first of all I LOVE, LOVE, LOVE that quote! I read it three times. And OMG…how true, how true those words are! Second of all your poem AND photograph are fabulous! You have such a great gift for writing. You really do! I wonder what kind of foot tracks are those? They look like a wolf perhaps?!? Wonderful shot! Have a super weekend, my friend. It’s supposed to be very warm here (high 60’s). I may take a day trip into NYC for the day on Sunday! Glad you love this quote as much as I do, Ron. Somehow, it just rings true, doesn’t it?! Thanks for your lovely compliments — and for making me blush! I love when something I’ve written gives someone pause to reflect or a spot of enjoyment. Sorry, no cougars here (that I know of!). I think it’s merely a “common” house cat, though most cat owners will probably take offense at that, swearing that NO cat ever thinks itself “common,” ha! Sweet! Missed following your footsteps. Pat, I’ve missed you, too — in fact, I’m hoping over to your place this afternoon and trying to catch up! Thanks, John, but I think they might be kitty prints! Our neighbor has cats — no clue how many, but they seem more fond of my yard than of their own. Go figure. And that’s why I have a dog!